$6.99Pack of 5 Purple Glowsticks - 8"
Have you ever wondered how many different kinds of fairies are out there? We think there is probably a different kind of fairy for every occasion just because there's so much work to do in nature. There are the kind of creepy fairies with pointy ears and a long face that linger in the undergrowth of old growth forests and charm anyone who comes to close to the mushrooms they protect. Then there are those garden fairies who wear fluffy dresses who sleep on the inside of flowers at night. They know how to layer leaves and petals perfectly. Whatever fairy or angel you might be dressing as you're going to need a little sparkle for that mystical face of yours. 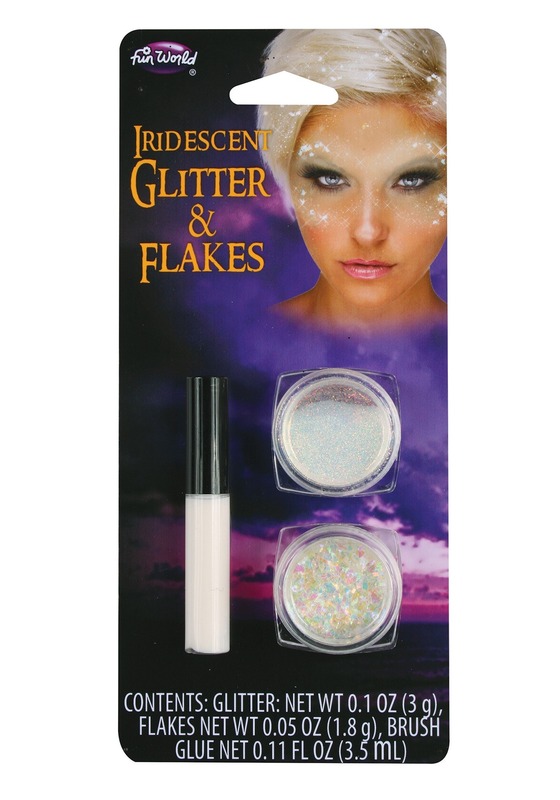 This iridescent face sparkle kit contains a container of flakes and a tub of sparkles. There is a tube of glue so you can be sure your sparkle will stay for an evening. It washes off with soap and water so when you're ready to return to reality, it'll only take a minute. Whether you're dressing up as a fairy, an angel, or you simply want a little more sparkle integrated into any look, you'll love the gorgeous pearl-like sparkles in this set. Top off your look with a long and magnificent wig and you'll feel like you're straight from a fairy tale!